Robert LaValva nurtures a vision to establish a permanent indoor public market at the historic Fulton Fish Market in Lower Manhattan. Each season, he cultivates the idea with enthusiasm, care and resolve and watches as it begins to take root. If the foot traffic on this sunny and warm Sunday morning at the New Amsterdam Market is an indicator, the seeds have been sown, and hordes of New Yorkers support LaValva’s dream. The vendor stalls are just beyond South Street tucked under the FDR Drive in the shadow of the Brooklyn Bridge. People are flooding the corridors between booths for this, the third meeting of the New Amsterdam Market. The seasonal event is – in effect – a dress rehearsal, aimed at building support for a permanent market to showcase artisanal products and regional, sustainable foods sourced within 500 miles of New York City. Organizers have their eyes on the now-abandoned Fulton Fish Market as the ideal location. 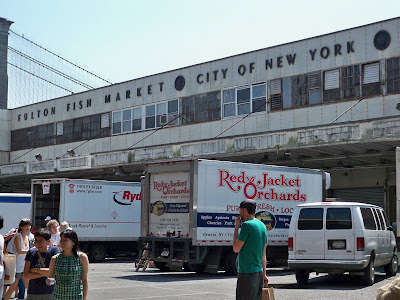 The New Market Building was constructed in 1939 by Mayor Fiorello LaGuardia. The structure belongs to the public, but in recent months some developers have entered the picture and are discussing the possibility of a hotel and retail space in the same vicinity. The area just in front of the building is lined with rows of booths hosted by enterprises with delectable names – The Bent Spoon, Flying Pigs Farm, Pampered Cow, and the people’s popsicle, to name a few. As soon as I enter the market, I spot an old friend. 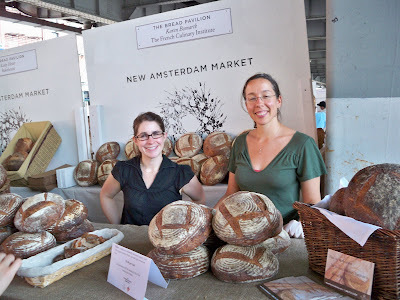 Chef Karen Bornarth (pictured below in green), my instructor for “Classic European Breads” at the French Culinary Institute is with a colleague selling her crusty, bronze Miche – large, peasant-style whole-grain loaves. She’s enjoying the market day and the entrepreneurial atmosphere. “We don’t usually get to sell our bread at the school,” she laughs. At the booth manned by Saxelby Cheesemongers, a gentleman hands me a sample sliver of raw cow’s milk cheese from Jasper Hill Dairy in Vermont, called Constant Bliss. It is named after a figure in the Revolutionary War. “Here he is, reincarnated,” the gentleman tells me as he hands me the slice. Constant Bliss is aptly named – smooth and creamy with a distinctive, peppery finish. The Queens County Farm Museum is selling a variety of produce and I spot a neat row of jars filled with amber honey. I ask the woman at the booth to describe the flavor of the honey, and to my surprise, she confesses that she has never tried it. 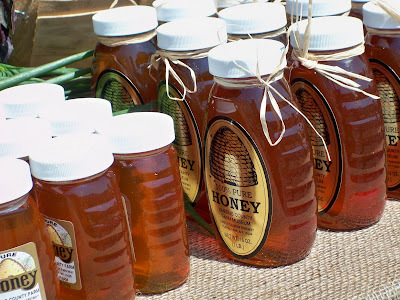 But, then she clarifies that she has only been working at the museum a short time, and the honey was just extracted from the 11 hives on the property less than a week ago. I purchase a 6-ounce jar. “Let me know how it tastes,” she says. I wander the aisles sampling pickled asparagus from rick’s picks on Chrystie Street, and tangy sharp cheddar from Farmstead Fresh in Winfield, PA. All around me, elbow-to-elbow, there are old people, young people and babies in strollers sampling cheese, examining fresh cherries and tasting oysters. 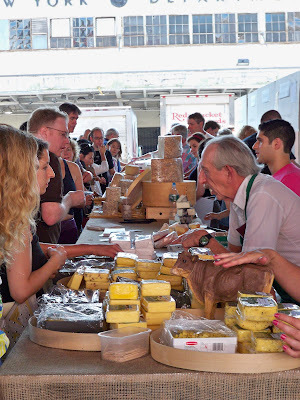 The community has come out in full-force to meet bakers, producers, cheese makers and butchers, and has brought along its appetite for regional foods. My bag is now bulging with delicacies that will sustain me through the week and beyond, and my wallet is nearly empty. I manage to spend a few moments with Robert LaValva, director of the not-for-profit, New Amsterdam Public, the organization created to bring the market to fruition. 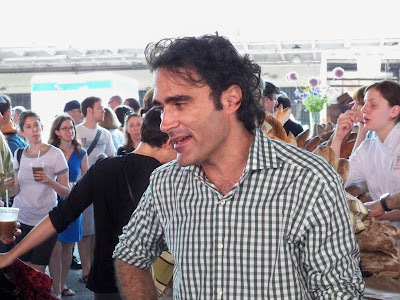 Dress in a green-checked shirt and jeans, he is a tall, slender man with jet-black hair and a soft-spoken manner who is quietly passionate about his vision. It has taken New York some time to come to grips with what LaValva calls “this civic, urban thing called a public market.” Europe has many established markets, as do several cities in the United States. LaValva sees a future that will draw on New York’s agricultural heritage and its rich history, ultimately benefiting the economy of the region. “New York once had such a market,” he tells me, “but it was less out of philosophy, and more out of necessity,” as purveyors would gather at central locations in the city to sell their wares. “We are standing on the site of the city’s first market, established in 1642,” LaValva says. The location along South Street was a convenient gathering place for farmers from Brooklyn and the agricultural areas that surrounded the original boundaries of the city. What an exciting prospect, a full-time indoor market -- and on the site where there has always been a food market. 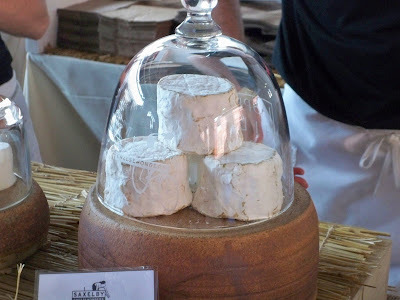 I'm partial to any market that sells Constant Bliss cheese; I spent a day at Jasper Hill Farm a couple of years ago, with a group of chefs from Providence, helping to make Constant Bliss. It was incredibly hard work, and a good reminder of the dedication required to produce artisan and small-batch foods. Let's hope the indoor market finds a home at the seaport. You are so lucky to have markets like this sprouting. I'm moving further north! I think this is a great place for the market and hope it will become permanent. I drive 25 miles one way on Saturday mornings to get to an outdoor market with very meager offerings. Nowhere near as exciting as the New Amsterdan Market, but if it's not supported now, it will never grow. I'm not sure I'll live long enough to ever see something like this in Houston. Oh T.W. I'm getting quite a list of places to visit in Manhattan thanks to your deliciously descriptive posts. I will be moving to PA permanently by summers end and have vowed to take memories of the city's tastes with me. Thank you so much for another introduction to what is possible strolling through the city on a summer Sunday morning. You lucky man to capture all those goodies. I'll take one of everything! please. What a terrific market! There is something about fresh, local that is irresistible. And those beautiful amber bottles all lined up are making me lick my lips. Hi Lydia - I think this project is so important. I'm very hopeful that they will succeed. And, I have to tell you, I now think of you whenever I spot a disk of cheese from Jasper Hill! Veron - Come on up!! Kathy - In fact, I traveled quite a ways from Long Island to visit the market, but I would do it again. Fingers crossed. Louise - you will have to report on some of the regional food options when you take up permanent residence in Pennsylvania. Susan - I thought of you as I walked through the market. I remember thinking, "The Food Blogga would love this!" That is so great! I would love to have such a market near my home. I hope it takes root there, I know a lot of people would really love that. 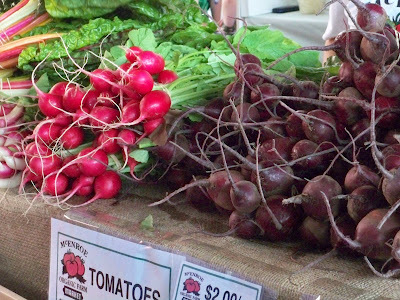 Tiffany - there are so many wonderful resources in the New York area for local food, that it would be great to a have a central market where people could have easy access to their excellent product. Oh, I so wish I could have bee at this!! (I meant "Been" but obviously am sidetracked by the cake in the previous post). As for the name "Constant Bliss"--that has got to be my favorite cheese company name, like, ever! !